Five Phase Medical is a reseller of Mack Software products and consultants in the medical and spa arena. 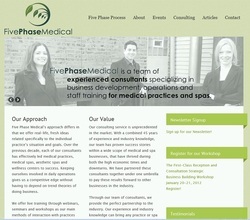 Five Phase Medical is a team of experienced consultants specializing in business development, operations and staff training for medical practices and spas. Click image to open Five Phase Medical's website for more details.